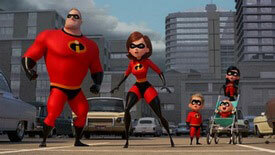 "Incredibles 2": In this long-awaited sequel to the very popular "Incredibles" (2004), Helen (voice of Holly Hunter) is called on to lead a campaign to bring Supers back, while Bob (voice of Craig T. Nelson) navigates the day-to-day heroics of �normal� life at home with Violet (voice of Sarah Vowell), Dash (voice of Huck Milner) and baby Jack-Jack -- whose super powers are about to be discovered. Their mission is derailed, however, when a new villain emerges with a brilliant and dangerous plot that threatens everything. But the Parrs don�t shy away from a challenge, especially with Frozone (voice of Samuel L. Jackson) by their side. Incredibles 2 is a great PG-rated outing for the whole family, very watchable (over and over). But get the original first. (By the way, "Incredibles 2" almost quadrupled the original's box office take). Co-stars the voices of Brad Bird, Bob Odenkirk, Catherine Keener, Jonathan Banks, Sophia Bush, Isabella Rossellini. Extras include a theatrical short: �Bao,� commentary; the Blu-ray adds �Auntie Edna� mini-movie; deleted scenes; "Super Stuff" featurette; "Heroes & Villains" mini-docs; "Strong Coffee: A Lesson in Animation with Brad Bird"; outtakes and stories; more. From Disney. "BlacKkKlansman ": From visionary filmmaker Spike Lee comes the incredible true story of an American hero. In the early 1970s Ron Stallworth (John David Washington) becomes the first African-American detective in the Colorado Springs Police Department. Determined to make a difference, he bravely sets out on a dangerous mission: infiltrate and expose the Ku Klux Klan. He recruits a seasoned colleague, Flip Zimmerman (Adam Driver), into the undercover investigation. Together, they team up to take down the extremist organization aiming to garner mainstream appeal. "BlacKkKlansman" offers an unflinching, true-life examination of race relations in 1970s America that is just as relevant in today�s tumultuous world. Based on the book "Black Klansman" by Ron Stallworth. Some of Lee's best -- and most hard-hitting -- work in a long while. Highly recommended. Co-stars Topher Grace, Corey Hawkins, Laura Harrier, Alec Baldwin, Ryan Eggold, Paul Walter Hauser. Extras include "A Spike Lee Joint" featurette in which producer Jordan Peele, cast and film subject Ron Stallworth discuss the unique experience of working with iconic director Spike Lee; "BlacKkKlansman" extended trailer featuring Prince�s �Mary Don�t You Weep.� From Universal. Also due this week: "Christopher Robin ," a sweet if innocuous live-action/animated film about a grown-up Christopher Robin (Ewan McGregor) who has lost his way as a grown-up and gets guidance from his childhood friends -- Winnie the Pooh and Tigger, too -- who venture into our world to help him rediscover the joys of family life and friendship. From Disney. 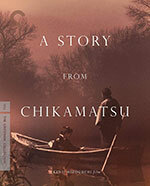 One of a string of late-career masterworks made by Kenji Mizoguchi in the early 1950s, "A Story from Chikamatsu " (a.k.a. The Crucified Lovers) (1954) is an exquisitely moving tale of forbidden love struggling to survive in the face of persecution. Based on a classic of 18th-century Japanese drama, the film traces the injustices that befall a Kyoto scroll maker's wife and his apprentice after each is unfairly accused of wrongdoing. Bound by fate in an illicit, star-crossed romance, they go on the run in search of refuge from the punishment prescribed them: death. Shot in gorgeous, painterly style by master cinematographer Kazuo Miyagawa, this subtly sensuous indictment of societal oppression was heralded by Akira Kurosawa as a "great masterpiece that could only have been made by Mizoguchi." On DVD and Blu-ray, with new 4K digital restoration, with uncompressed monaural soundtrack on the Blu-ray. From The Criterion Collection. 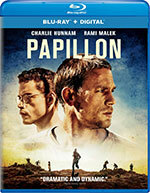 "Papillon " (2018), starring Charlie Hunnam, Rami Malek, Yorick van Wageningen, Roland Moller and Tommy Flanagan, is based on the international best-selling autobiographical books "Papillon" and "Banco," that follow the epic life of Henri "Papillon" Charri�re (Charlie Hunnam), a safecracker from the Parisian underworld who is framed for murder and condemned to life in the notorious penal colony on Devil's Island. Determined to regain his freedom, Papillon forms an unlikely alliance with quirky convicted counterfeiter Louis Dega (Rami Malek), who in exchange for protection, agrees to finance Papillon's escape. A powerful portrait of the resilience of the human spirit, even in the face of utter inhumanity. Remake of the 1973 "Papillon" starring Steve McQueen and Dustin Hoffman. On DVD, Blu-ray, from Universal ... "Breaking Brooklyn " (2018), starring Colin Critchley, Nathan Kress, Madeleine Mantock, Louis Gossett Jr. and Vondie Curtis-Hall, filled with energetic song and dance numbers, tells the story of a homeless young dancer and his brother who are taken in by an old Broadway showman when their father is arrested. When one of the young men learns that their new guardian could lose his theater, they enter a dance contest to save it. From Lionsgate ... In "Girls vs Gangsters " (2018 -- China), starring Fiona Sit, Ivy Yi-Han Chen, Janine Chun-Ning Chang and Mike Tyson, a wild bachelorette weekend in a foreign city spins hilariously out of control in this over-the-top sequel to the box office smash Girls. After a drinking contest with some questionable local spirits, three friends wake up naked on a beach to discover two are handcuffed to a locked suitcase, one has a strange new tattoo, and none of them have any clue what happened the night before. When they soon find themselves pursued by local gangsters, their only shot at making it home -- and to the altar -- is to piece together the previous night's events while on the run. From Well Go USA ... Based on famous folklore, "Mara 's" (2018) storyline tells the tale of criminal psychologist Kate Fuller, who starts to experience the same terrifying symptoms as the victims of an ancient demon who kills people in their sleep. Stars Olga Kurylenko, Craig Conway, Javier Botet and Rosie Fellner. On DVD, Blu-ray, from Lionsgate ... In "Loving Pablo " (2017), Javier Bardem and Pen�lope Cruz star in the true story of drug lord Pablo Escobar and his passionate love affair with journalist Virginia Vallejo that led to his downfall.On DVD, Blu-ray, from Universal ... 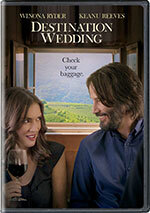 In "Destination Wedding " (2018), Keanu Reeves and Ryder star as the socially awkward Frank and Lindsay. When they meet on the way to a destination wedding, they soon discover they have a lot in common: they both hate the bride, the groom, the wedding, themselves, and most especially each other. As the weekend's events continually force them together -- and their cheerlessness immediately isolates them from the other guests - Frank and Lindsay find that if you verbally spar with someone long enough, anything can happen. When debate gives way to desire, they must decide which is stronger: their hearts or their common sense. From Universal ... In "Beyond the Sky " (2018), starring Ryan Carnes, Jordan Hinson, Martin Sensmeier, Don Stark, Peter Stormare and Dee Wallace, Chris Norton (Carnes) has been hearing about alien abductions his entire life but, in his gut, he knows they are not real. Setting out to disprove the alien abduction phenomenon once and for all, he attends a UFO convention to meet alleged abductees and reveal the truth behind their experiences. It is only when he meets Emily, who claims to have been abducted every seven years on her birthday, that Chris realizes there may be more to these claims than meets the eye. With Emily�s 28th birthday only days away, Chris helps her to uncover the truth as they come face to face with the reality that we are not alone. On DVD, Blu-ray, from RLJE Films ... 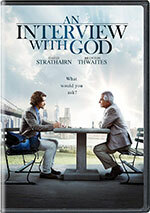 In "An Interview with God " (2018), starring David Strathairn and Brenton Thwaites, after covering the war in Afghanistan, journalist Paul Asher returns home to find his life falling apart. With his marriage near collapse, he's in the grips of a personal crisis he's struggling to understand. But the young reporter's life takes a strange turn when he is offered the opportunity of a lifetime -- an interview with a mysterious man claiming to be God. From Universal ... "Sleepwalkers " (1992), starring Brian Krause, Alice Krige and M�dchen Amick, is a terrifying tale of modern-day vampires who move from small town to small town to prey on virtuous young women. Imperceptibly inhuman to everyone except for felines, these vicious shape-shifters have their eyes on a new victim: Tanya, the sexually curious virgin who falls for Charles, the new boy in school. Mutating at will from golden boy to savage monster, Charles stalks Tanya to feed his seductive mother. As the tension mounts (and the casualties pile up), the town's tabbies gather for a final, chilling showdown with the monsters in their midst. Features cameo appearances by Stephen King and horror legend Clive Barker. In a special Collector's Edition Blu-ray from Scream Factory. "Marlina the Murderer in Four Acts " (2017 -- Indonesia): In the deserted hills of an Indonesian island, Marlina (Marsha Timothy), a young widow, is attacked and robbed of all her livestock by a gang of seven bandits. She then defends herself, setting out on a journey to find justice, empowerment, retribution and redemption. But the road is long, especially when she begins to be haunted by the ghost of her victim. A stunning Scope western set to a Morricone-inspired score, this unique tale of female cinematic revenge takes no prisoners. From Icarus Films. "The Little Witch" (2018 -- Germany), starring Karoline Herfurth, Axel Prahl, Luis Vorbach, Momo Beier and Suzanne von Borsody, has a big problem: she's only 127 years old, which is much too young to dance on the Brocken Mountain on Walpurgis Night. When she unsuccessfully tries to sneak into this most important of all witches' dances, her punishment is she must learn all 7,892 spells in the great book of magic within one year. Hard work and ambition are not exactly the Little Witch's strengths, and the evil witch Rumpumpel is trying everything she can to prevent the Little Witch from learning all the spells. With her talking raven Abrazas, the Little Witch sets out to discover what makes a good witch, and puts the entire witches' world to the test while she is at it. 12+ Dove Foundation Approved adventure. From Breaking Glass Pictures ... "Pat Boone and Family: Christmas & Thanksgiving Specials" includes two holiday entertainment programs on DVD for the first time. Pat Boone is joined by his four singing daughters -- Debby, Cherry, Lindy and Laurie -- and his wife Shirley in these music and comedy specials that first aired on ABC in 1978 and 1979. The Christmas show includes classic holiday songs and comedic moments with the hyper-charged Hudson Brothers plus stars from ABC's "Three's Company," "Happy Days" and "The Love Boat," as well as appearances by songbirds Dinah Shore and Rosemary Clooney. The Thanksgiving special features Bob Hope and the Hudson Brothers. From MPI Media. 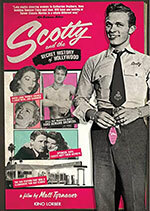 "Scotty and the Secret History of Hollywood " (2018) is the deliciously scandalous story of Scotty Bowers, a handsome ex-Marine who landed in Hollywood after World War II and became confidante, aide-de-camp and lover to many of Hollywood's greatest male -- and female -- stars. In the 1940s and '50s, Scotty ran a gas station in the shadow of the studio lots where he would connect his friends with actors and actresses who had to hide their true sexual identities for fear of police raids at gay bars, societal shunning and career suicide. An unsung Hollywood legend, Bowers would cater to the sexual appetites of celebrities -- straight and gay -- for decades. While the studio PR machines were promoting their stars as wholesome and monogamous, Bowers was fulfilling the true desires of many of them. This cin�ma-v�rit� documentary by director Matt Tyrnauer ("Valentino: The Last Emperor") tells his story, as well as presents eyeopening takes on icons from the Hollywood Golden Age including Cary Grant, Katharine Hepburn, Spencer Tracy, Lana Turner, Ava Gardner and many more. From Kino Lorber. "The Good Fight: Season Two" (2018) is a four-disc set with all 13 episodes. Season Two of the spin-off from "The Good Wife" follows Diane Lockhart (Christine Baranski) as she continues to fight her way to the top. With the world going insane and the Chicago murder rate on the rise, Diane, Lucca (Cush Jumbo), Maia (Rose Leslie) and the rest of the law firm find themselves under psychological assault when a client at another firm kills his lawyer for overcharging. After a copycat murder, the firm begins to look at its own clients suspiciously, while Diane battles with a new partner at the firm. Meanwhile, Maia becomes harder and tougher after her parents' scandal puts her on trial and Lucca is brought back into Cohn's (Justin Bartha) orbit. From CBS/Paramount ... "Poldark Season 4" (2018) is a three-disc set with eight episodes. The PBS Masterpiece series returns for a fourth season of action-packed episodes, starring Aidan Turner as the roguish Ross Poldark and Eleanor Tomlinson as his fiery partner, Demelza. In Season 4, it�s 1796, and to defend Cornwall and those he loves from an empowered George, Ross must play the political game on a journey that takes him to the nation�s capital and into new perils. On DVD, Blu-ray, from PBS Distribution ... "Succession: The Complete First Season" (2018) includes all 10 episodes. The saga of a fictional, American media family whose wealth and power are matched only by their dysfunctional dynamic. Set in New York City, the series follows the Roy family � headed by the aging patriarch Logan Roy (Brian Cox;) and his four children � who together control one of the biggest media communications and entertainment conglomerates in the world. The Roy�s story is compelling and often comedic, as they out-maneuver each other through cut-throat family and business dynamics, while contemplating what�s in store once their father passes. On DVD, Blu-ray, from HBO.